This is the first time I'm sharing something traditional on my blog. I am kashmiri, but born and raised in Lahore with typical Punjabi Culture. I love my Pakistani culture and traditions, Pakistan has a rich cultural heritage and has a long jewellery history. One of the first to start jewellery making were the peoples of the Indus Valley Civilisation which encompassed in Pakistan after partition in 1947. However, Pakistan is a hub of traditional jewellery and design various kind of jewelleries, like Antique jewellery, bridal jewellery, kundan jewellery, polki jewellery, custom jewellery and handmade jewellery. I remember when my mom used to wear such kundan and polki jewelleries in my childhood and I have been always wanting to wear kundan jewellery. Bridal Polki/kundan ring are used to describe a particular type of jewellery made with real gold and precious stones studded beautifully with pearls and stone drops. My mom wore a very beautiful and precious kundan necklace at her wedding day and after long time kundan again in fashion now, but because of skyhigh gold prices, most of us cannot afford real gold. I went anarkali market and found some artificial kundan style jewellery, these are not made with real gold, but high quality metal with fine quality stones. However, they can't be as beautiful as real kundan jewellery is, but still they look good and affordable. 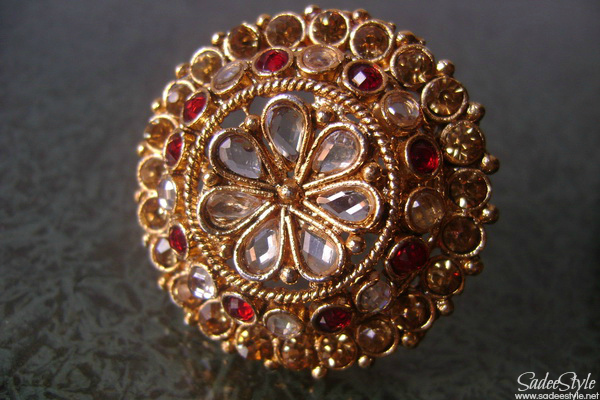 I bought this ring just in 450 rupees, Kundan jewellery comes in various color combinations, I love them in red, green and champagne colors and the ring I bought has three white, red and champagne stone, which is defiantly a great combo and looks really pretty. Do you love wearing jewellery? What kind of jewellery do you wear the most? Yeah marib i bought some jewellery as it's a wedding season in pakistan. I will share them soon! You have a lot of Kundan rings but don’t really know how to take care of them. Visit this blog page, and get to know everything that could help you preserve your earrings for long. 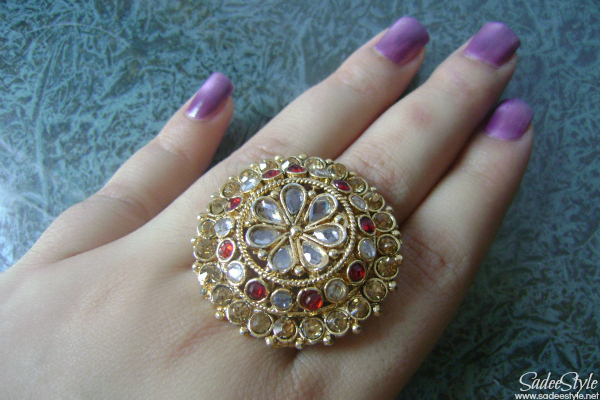 I started taking good care of my precious and beautiful Kundan rings, after I started visiting this site. The content of this page is highly informative, and it works well. Now my rings are far shinier and they are safe. I can use them again and again, and this is just due the tips that I followed from this blog page. Thanks to the writer, that has helped us preserve our mystique pieces. Amazing ring!!! I would love to buy it for my next function!!! Where did you get it from? Wow!!! The rings in your collection are heart-throbbing. They can be the expectation of every girl!!! Indian style jewelry is my favorite case. I purchased my own neckalace from online jewelry service.